Are you planning on installing a new swimming pool in your backyard? You could put in the same old rectangular or oval-shaped pool that everyone else in your neighborhood has or you could put in something totally unique with a free form pool. Crites Custom Pools has experience building all kinds of custom-made pools, and we can come up with something truly special for your backyard if you want to wow all of your guests and have a unique design for you and your family to enjoy every day. There are many advantages that come with adding a free form pool at your property. The most obvious one is that you will get to create a pool that takes on any shape that you want it to. You don’t need to be confined to straight lines and 90-degree angles or simple rounded forms when you sit down to design your free form pool. Rather, you can let your mind wander and come up with any design you want. This is a great option to have because it will allow you to fill the space in your yard better than a traditional pool. So if you have an unusually large yard or a yard that isn’t simply a rectangle, you can give it some personality with a free form pool. The pool will give your yard – and by extension, your home – a unique look and feel that can carry your home’s unique style into the outdoor spaces. You will be blown away by what Crites Custom Pools is able to do, and you will fall in love with the design that we come up with for your new pool. Just take a look at some of the work that we have done in the past so that you can get an idea of what to expect from us. Not sure what you’d like to do? We can also come to you and provide a free consultation to discuss what’s possible with your property. 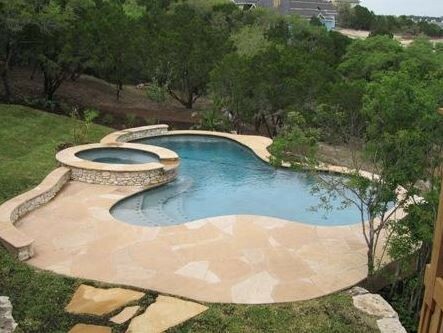 Get started by calling Crites Custom Pools at 512-759-2630 and speak with one of our free form pool designers today.